It is an opportunity to pass down family holiday traditions. It is an opportunity to create memories. and a way to make a homemade Christmas gift. 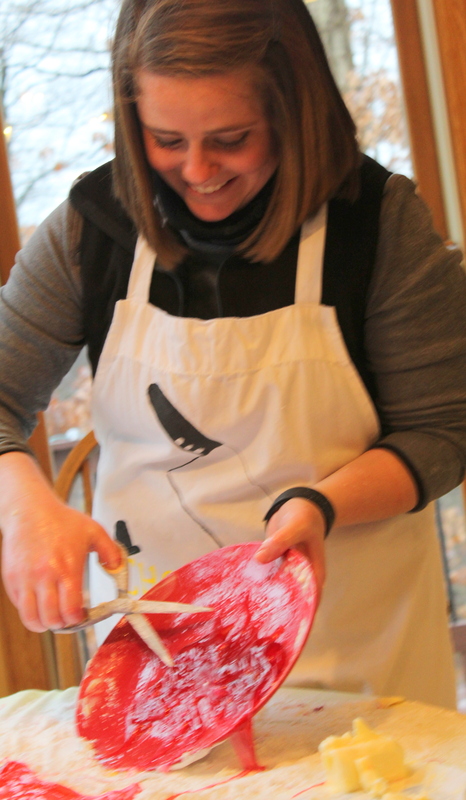 So when my daughter-in-law, Colleen asked if we could make hard tack candy this year, I was so excited! It has been quite a few years since the days when I was about her age and my mother-in-law taught me. My sister-in-laws and I got together every year with my mother-in-law to make hard tack candy around this time (Thanksgiving weekend), so that the guys could take a bagful in their pockets for their annual deer-hunting trip, which always opens the Monday after Thanksgiving in our neck of the woods, and we would have plenty to enjoy and share as a special homemade gift. The recipe is quite simple, but also a bit messy, so we were very fortunate to have an extra helper this year in Charlie, who kept the floor lickety-split clean from any powdered sugar, butter or flying candy that hit it! Colleen and her sweet sister, Katie, caught on amazingly quick, and we ended up making 10 batches to split between the three of us. We were happy with our results, and now the tradition has been started for the next generation. There is still plenty of time to make this sweet treat and create some memories with a new family tradition. Mix water, sugar, and corn syrup in a saucepan. 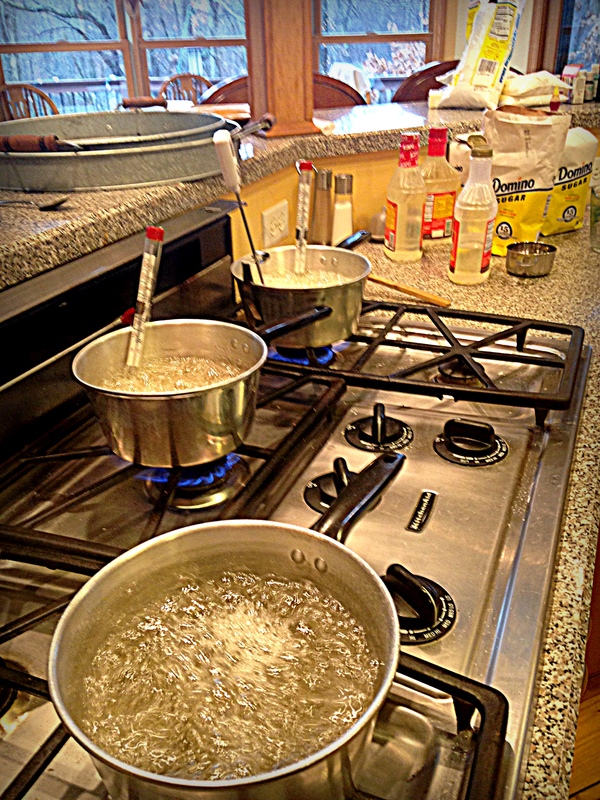 Heat to boiling and boil until it reaches 300 degrees F (hard tack) on a candy thermometer (takes about 20 mins). While that is cooking, prepare your cutting station. Cover counter or table with an old tablecloth. Pour powdered sugar directly onto the tablecloth and spread around. Amply butter three dinner plates and place on table amidst the powdered sugar. Sterilize scissors or kitchen shears in a pot of boiling water. 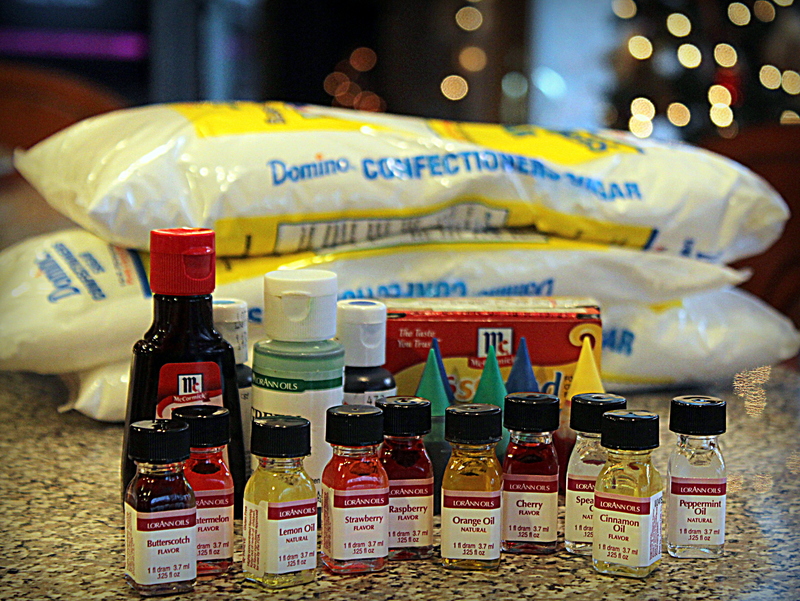 When the mixture reaches 300 degrees F, remove from heat and add food coloring and oil flavoring. Stir until combined. Pour onto prepared buttered dishes, dividing evenly between the three. Let it cool for up to a minute, then begin gently pulling with scissors to edge of plate. With buttered hands, begin to pull and cut it off into the powdered sugar. You can snip a little at a time, or pour off large dollops into the powdered sugar. Let cool slightly and turn over to assure both sides have powdered sugar on them, but do not allow the powdered sugar to mix INTO the candy. Snip with shears into bite-sized pieces. Place in a colander and shake off excess powdered sugar. Spread out on a platter to cool completely. 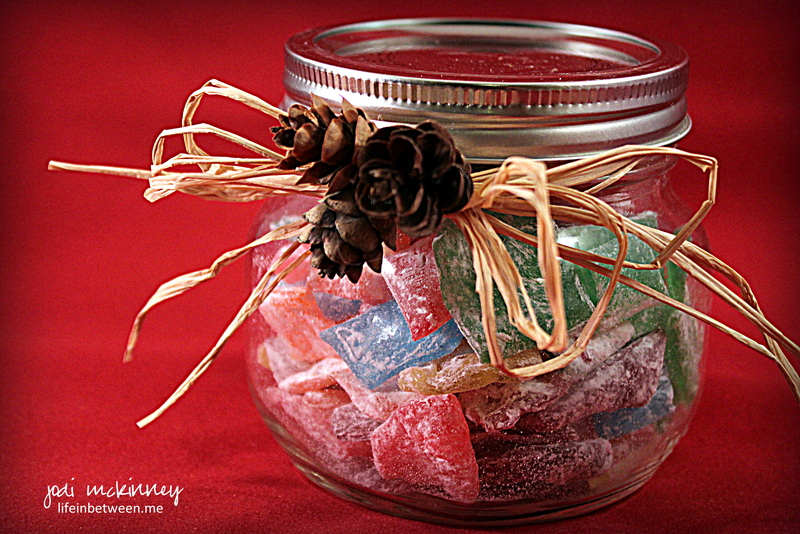 Store in air-tight containers, mason jars, or Ziploc baggies. I can’t even imagine making this by myself. I think a minimum of three people are needed to keep it moving as you need to work fast once you pour it as it cools quickly. Plus – it is so much more fun doing it together! It is HOT! Be prepared! Butter your hands and plate liberally to be able to deal with it, and work quickly. 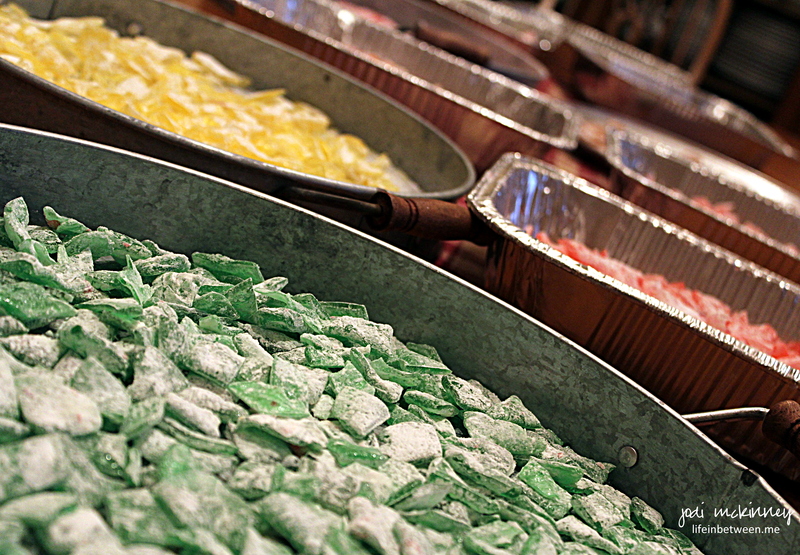 Be careful when pouring in the oil flavorings as some are very potent – cinnamon and the mints especially. Be sure not to breathe in directly over the pot, and have the room well ventilated – open the door or window if necessary and have your exhaust fan on. Some people pour the hot liquid into a pan, let it cool, and then crack it by banging the pan on the counter or table or using a gentle small hammer or tool to pound and crack. I think that makes it very sharp, but you can do that if you prefer. If you make cinnamon and mint along with fruit flavors – store separately until you put together to gift or serve as the cinnamon and mint flavors can overpower all others. I hope this was helpful. Any questions, let me know. 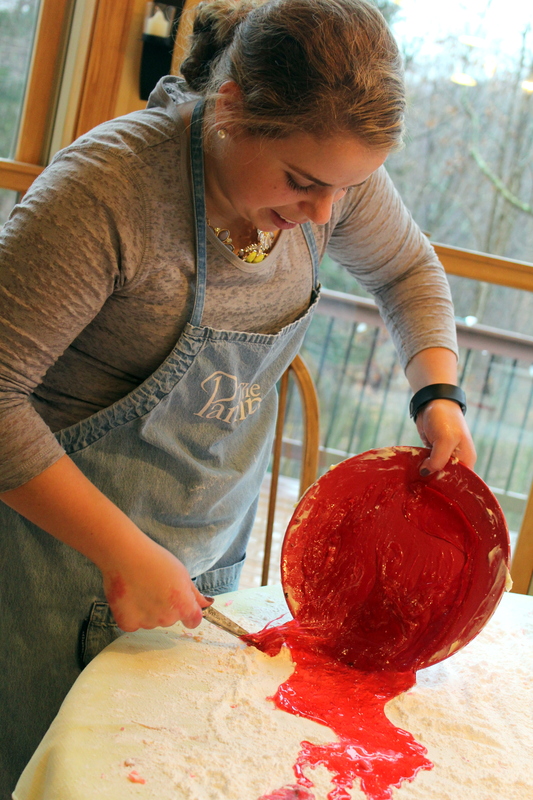 Do you have a favorite holiday cooking or baking or crafting tradition? Beautiful post ! So nice to see family traditions being enjoyed and carried on ! How is Charlie reacting to the Christmas decorations hanging around 😉 ? He is doing unbelievably well. 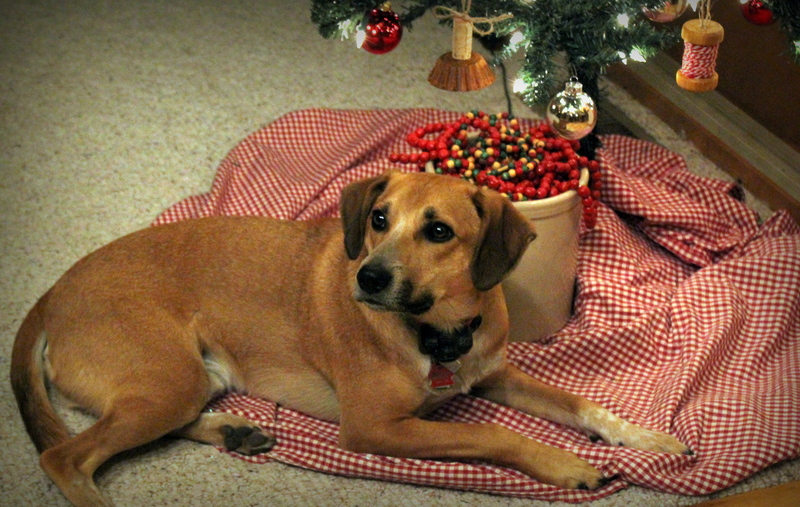 I thought for sure he would want to play with the Christmas tree ornaments, but he leaves them alone and lays under the tree! 🙂 I’m so happy! Fun! I can’t wait for my daughter to finish up college exams so we can get busy making Christmas cookies. I need some snickerdoodles! Yes, I know she would! What fun! I can see such joy all all your faces including Charlie’s! I loved this post, just makes me so happy! Awh! Thanks for sharing in the joy Cathe! This is so special! What a fun time for you and your daughter in law and her sister! How cute that Charlie was a big helper lol! I need to try this! You have lots of helpers! You will love it Lynn! You make that look fun! Beautiful post and photos ~ you all look like you’re having fun! In our house the tradition is making Krumkake, those light, crisp Scandinavian cookies. My mouth is watering! Ooooooh. ! Would you share the recipe? They sound divine! I’d be glad to. This is my hubby’s grandma’s recipe. You’ll need a krumkake iron. We got an electric one at Amazon and it works great. The ingredients: 2 eggs, 1 cup white sugar, 1/2 cup melted butter, 1 scant cup whole or 2% milk, 1-1/2 cups flour, 1 teaspoon vanilla, 1 tablespoon brandy. Beat the eggs until light. Add sugar, butter and vanilla. Next add milk and flour. Pre heat the iron and test to be sure it’s hot. Pour 2 teaspoons of batter on the iron; bake until very light brown, about one minute & 15 seconds. While still warm, roll quickly into cone shape – careful, it’s hot to handle. Let cool completely. They’re good plain or with a little dusting of powdered sugar. This makes about 30. It really goes best with two people working – one to do the batter and one to roll. I’m sorry I don’t have a picture but they look beautiful. Enjoy! Toss up – butter scotch or strawberry. What a lovely family thing to do in your beautiful home. Gorgeous inside and out, everyone and thing. Yummy too. What a lovely time. This looks so fun! What fun tradition to share! I just want to come over to your place this Christmas season and make things with you! So cool! But I can. And you can eat. That’s what makes me happiest. Fingers crossed!!!! How nice that you are continuing that tradition with your daughter-in-law! And I am impressed that you can make your own candy…I think that’s a little beyond me. BUT, I have a batch of your hot cocoa brownies in the oven as we speak, and they smell wonderful! They were very good! I took them to my book club tonight, and everyone loved them! YAY! So glad you all enjoyed! They are decadent! Hi Jodi! 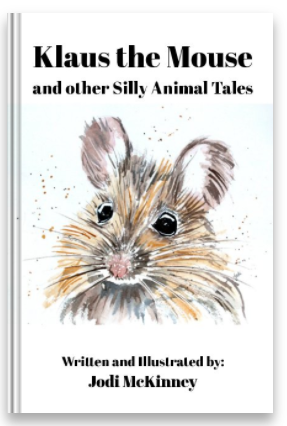 I’m late reading this but I’m oh so glad I did! 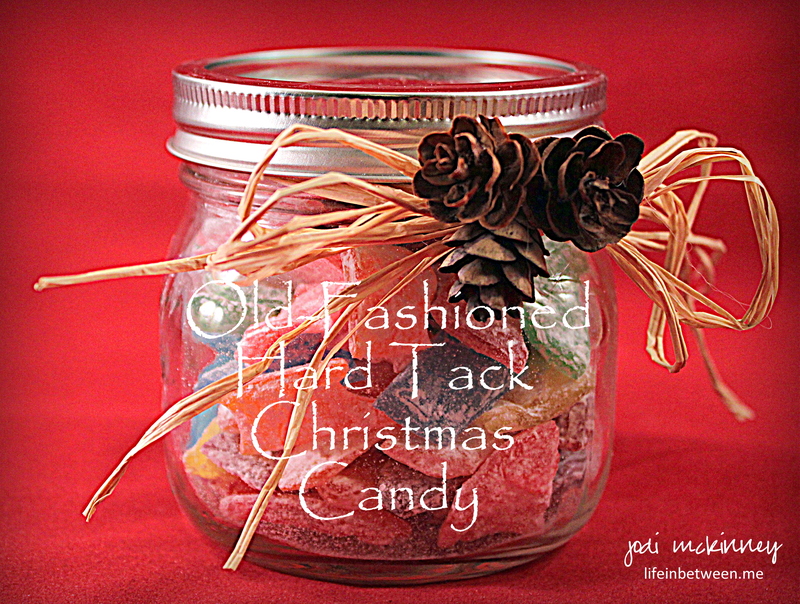 I used to make hard tack candy when I was in high school every year around the holidays. I learned how from my home ec teacher (now I’m showing my age, huh). My whole family loved it and they pretty much left it up to me to do on my own. Mind you, I didn’t make 10 batches. I remember putting my face in the stock pot after adding cinnamon oil and I about couldn’t breathe with my face turning red for hours! Don’t do that! Ha ha. I lost the recipe over time and have always thought about searching for it again but just never did. You’ve just given me a chance to show my 12 year old daughter and 10 year old son our new tradition! Thank you so very much! Wow! You did it all by yourself?! And as a teenager! How amazing! Oh that cinnamon is potent! I was being careful, and I still had to step outside to get some fresh air after pouring it on the plates! I hope you do share this with your children and create a new tradition and memory! Please share about it when you do! 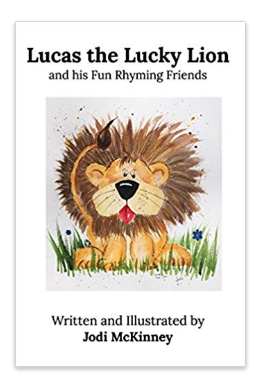 Thanks for visiting and writing. Happy Holidays!